Stella Maris College for Women. Interning at DakshinaChitra has been an instrumental part of my life. It has boosted my confidence, efficiency and made me bolder to face the challenges. This museum management program has given me an opportunity to explore more about the museum activities and its functioning. I was given hands on experience in the field of art gallery management, library administration, documentation, educational programs and publicity strategies. The lectures, interaction with native craftsmen and artisans gave me valuable insights on traditional art and crafts. It will be hugely helpful for my career in the arts in future. As an archaeologist, I had theoretical knowledge on museology but interning at DakshinaChitra instilled in me practical experience and also a new perception on the subject. Further the internship provided me a valuable opportunity, of learning from different departments starting from museum administration, handling of guests and visitors, museum collection, conservation etc. Working with each department was filled with fun and enriched with knowledge. The encouragement of staffs and love of housekeepers definitely made this internship program a most memorable experience. I wanted to work in a museum but I had neither knowledge nor experience when it came to Museum Management. 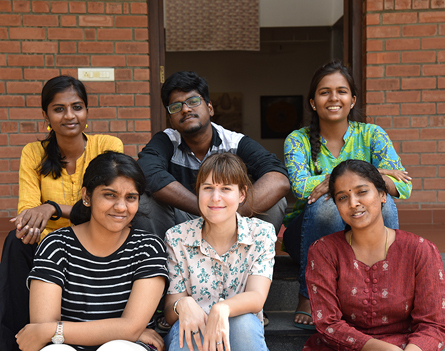 Internship at DakshinaChitra is really helpful as they make sure the interns work under each and every department of the museum for a significant period of time, enough to gain a good understanding. We are learning through the work given here. Now I have practical and thorough knowledge of how museums work and have a deeper understanding of areas I was not aware of. This has widened my horizons and shown me new areas I am interested in. We're almost 7 months into this internship and it has been nothing but fruitful. On a daily we get to not just witness but also experience different situations as we shuffle between the various departments. From taking schools and groups on guided tours to handling workshops to organizing large scale programs we've done it all. I can vouch for the fact that if one wants to be in the managerial departments of the art and museum industry, there is no better place that Dakshinachitra to gain the exact work experience required to take the plunge. JJ College of Engineering and Technology,Trichy. Though I studied Civil Engineering, I am very much interested in learning the art and culture of India. In order to pursue my interest I joined the internship program of DakshinaChitra. It's going good and I hope to learn more here. DKM College for Women, Vellore. To say about my evaluation of the internship as a whole now it's definitely a success. I got some valuable insights into the work field of an organization and to a certain degree also of an employee. I think it was the best choice for my professional growth. I find it a bit difficult to work as a team and I considered that was the challenging part because of the dedication, commitment and the interest each one had. And I had conducted three programs (Diwali and 2 village festivals, Tamilnadu and Pongal) independently and with a fellow intern as well and this gave me a tremendous experience on the whole. Gradually, I was managing the given activities on my own. Everyday is a new day when it comes to learning. I believe in ‘Complexity and Discomfort only makes you grow'. I frankly appreciate this internship. First of all, thank you so much for the time I had at DakshinaChitra. Till today, I keep talking about how it was a turning point in my life, and how it was such a beautiful one year. It helped me to unlearn a lot of things I had gotten used to in the corporate world and made me want to pursue something closer to the world of arts, culture and heritage. All these years I have been continuing my research and involvement with Colours, after our batch put up the Colour Symbolism creative exhibition and the panel discussion on Colours. I researched colour symbolism, I did a certification programme in Colour Strategy, I took part in some global colour forecasting workshops and now I have my own Colour venture. It is called Hue & Why. And it is precisely what the name suggests. It is about understanding the why or the logic behind colours and applying the same for spaces, brands, stories and for individuals. I am also trying to continue the research on colour meanings in culture - both ancient and contemporary. I am doing some work in colour trends and forecasting, and I am also exploring some painting series with colour stories.